When I first went vegan two and a half years ago, invigorated by the teachings of a few enlightening documentaries and YouTube videos, my first move was to write about it on Byrdie. This shocking newfound information about the harm America's mainstream meat and dairy industry was causing animals and the environment consumed my thinking, and (gently, because nobody likes an aggressive vegan) it was all I wanted to talk about. I put myself in this mindset that meat and dairy weren't even food. They were like plastic or bleach, bad for the planet and unfit for human consumption. Surely, I thought, if everyone knew what I knew about veganism, anyone who wasn't a total immoral sociopath would do it. I just had to show them the light. 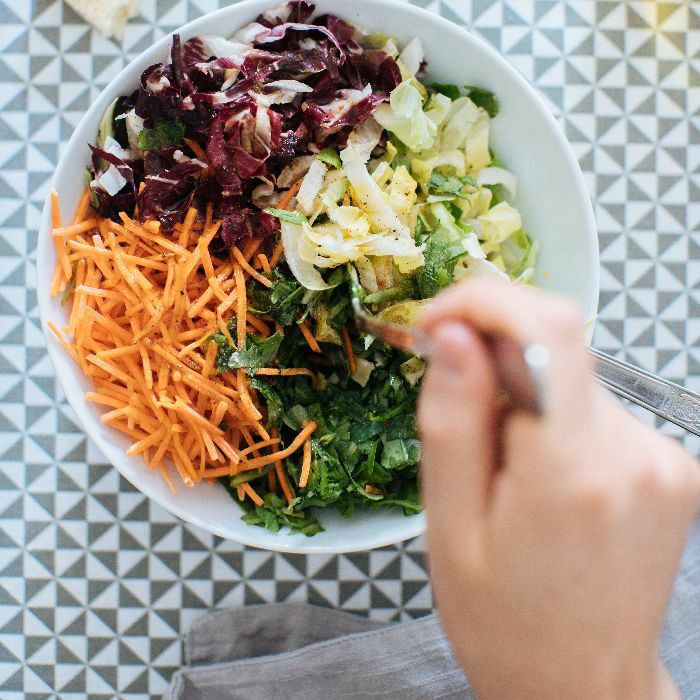 Here on Byrdie, I made it my mission to debunk the most commonly believed myths about veganism: I wrote about how affordable the vegan diet can be, how my decision to go vegan had nothing to do with wanting to lose weight or be a health nut. I wrote about the overwhelming environmental benefits of renouncing meat and dairy. Going vegan was easy if you knew the consequences of not doing so, I determined, especially in a place like Los Angeles. So why wouldn't I? Like anyone new to an unconventional lifestyle, I was militant in my beliefs and behavior. If I wanted to sleep at night knowing what I knew, I could never eat meat or dairy ever again, I resolved. But six months ago, the structure of my life was shaken to its core. I went through an earth-shattering breakup with my partner of seven years; I traveled 6000 miles away to spend a month in a foreign country; I ended work on a massive professional project that had been consuming my life for half a year; I got a new roommate (it's actually Byrdie's gem of an assistant editor Erin—hey, girl! ); I started dating for the first time as an adult. It's easy to follow a consistent diet or fitness routine when the rest of your life is totally in order. But all of these big events made me reconsider my personal happiness for the first time in a very long time. They made me reconsider why I was such a strict vegan in the first place. The vegan community, especially the online one that first exposed me to this lifestyle, tends to be really unforgiving (which influenced me to be the same way in the beginning). I always got the impression from many of the vegan YouTubers I follow—with their flawless açaí bowls and faux leather shoes—that if you're not a 100% perfect vegan, refusing to eat bread made with even a tiny bit of whey or a cappuccino topped with a splash of steamed milk, then why even bother? Unless you are perfect, you don't earn the label and deserve to have your vegan status, or "vegan card," revoked. I'd be lying if I said that the shame of letting myself have a little bit of dairy or use a non-vegan beauty product every once in a while didn't keep me from doing so out of fear. But what these major life changes forced me to consider was that, ultimately, your lifestyle choices have to be authentic and motivated by your own moral compass, or they won't be sustainable. These thoughts are fairly unspoken in the vegan community, but thankfully, a major vegan influencer named Kalel Cullen spoke in a refreshing YouTube video a few weeks ago in defense of being slightly more flexible. "I want to fight the stereotype that you have to follow all these rules in order to call yourself a vegan," she said. "People don't need to feel guilty because there's five [non-vegan] things they're still holding on to." After my breakup at the end of 2017, I started loosening the slack a bit on my vegan rules. While abroad earlier this year, I permitted myself to have some locally produced milk and cheese. Back in L.A., on a date or two, I let myself be convinced to have a few bites of non-vegan dessert. I scaled back on my militant approach to veganism, choosing instead to strike a balance between what's going to make me feel personally happy to be alive on a day-to-day basis (which, imperfect as this is, occasionally involves cheese) and what's going to have the least negative impact on the planet. Not everyone will agree, but for me, this felt like a healthier and more sustainable procedure than adhering to veganism 98% or 100%, only to risk eventually cracking and going back to not being vegan at all. A naturopathic doctor named Suneil Jain of Rejuvena Health & Aesthetics in Scottsdale, Arizona, once told me about the "80/20 rule" as it relates to dieting: "It's difficult to be perfect all the time, so cut yourself some slack. Aim to eat healthy 80% of the time. A missed meal or poor snack choice every now and then is okay, as long as it's the exception to the rule," he said. Ethics are the same way. There's rarely such a thing as 100% good and 100% evil. I have gotten to a place where I think as long as I am making my decisions about food, which are ultimately political and moral decisions, with intention, doing my best to minimize my negative impact, then I'm able to sleep at night. "Don't be ultra restrictive. Just be mindful," a registered dietitian named Lauren O'Connor once put it to me. At this point, I can say I'm more of an 80/20 vegan. In my opinion, this is a more accessible and inviting approach to the lifestyle, and it's one I think more non-vegans could wrap their heads around. And isn't that the whole point of veganism? To get as many people to care about animals and the planet as possible? Currently, only 0.5% of the American population is vegan. If being a partial vegan were more accepted, maybe we could get that number up to 2% or 10%, and overall, that would be better for the planet anyway. If this means my vegan card is revoked, then fine. I think I've made peace with that for now. One day I hope to get back up to 90% or 95% vegan. But being gentle with myself is what feels good for now, and so far, for me, that's okay. Do you have opinions on the 80/20 vegan concept? Feel free to DM them to me (nicely, please!) on Instagram @amanda_montell.